Today’s newest skiing destination is the reason I created this series - to discover ski areas that I would have never known about. Its easy to end up going to the more popular areas, but what about the smaller more local ski destinations with fewer people and more reasonable prices? And what better way to get recommendations than straight from other families who have already navigated the car park, bought tickets, chosen where to eat and have figured out tips and tricks themselves to make the day more enjoyable. 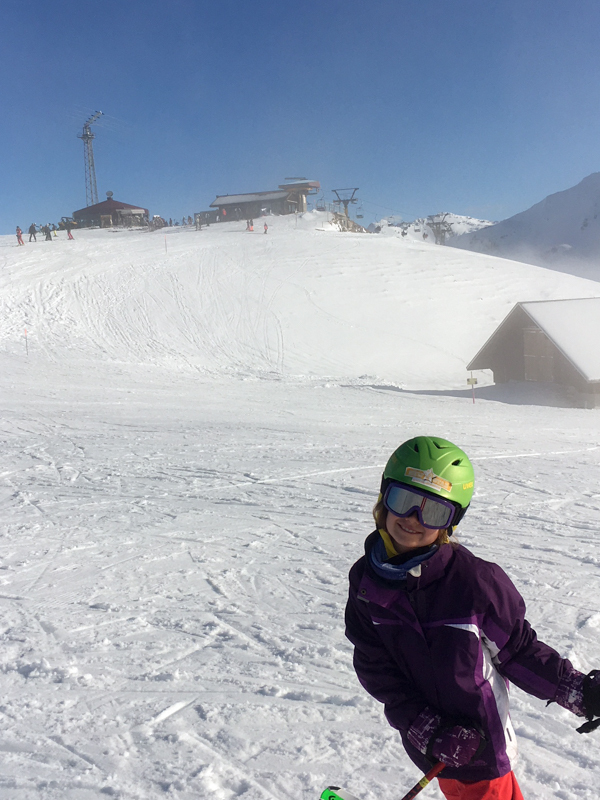 Today, Jenni is back to share with us her current favourite place to ski with her kids, Klewenalp (Stöckhütte), in canton Nidwalden. Klewenalp (Stockhütte) which is located above the Vierwaldstättersee in Canton Nidwalden. You can take public transport (Train and a bus from Luzern main station) but we normally drive as it’s relatively close to Luzern. Park at Emmetten and get a gondola to Stockhütte. Parking is free. You can access the whole ski area from both ‘ends’ – which are linked by a 2 person chairlift. We prefer to park at the Emmetten ascent so there is no waiting for cable cars and to ‘get going’. Beginners to intermediates. Check out the Piste plan here. I would recommend going here once your family is all comfortable skiing the blue level runs and has the desire to occasionally ski the red runs. There is a lovely long blue/red piste at the Stockhütte end with trees either side. At the Klewenalp end there are blue/red pistes which are more of a challenge but the runs are wide and they are not too long. For us, the only drawback is that these ‘main’ runs are served by T-bar lifts and one button lift. They can be a bit tricky initially but the staff who man the lifts are friendly, alert and helpful. So don’t let this stop you from trying! At the ‘back’ of the resort there is a longer blue/red piste served by a chairlift which is perfect for confident blue/red skiers. There is a ski school and areas for total beginners. At both ends this is right next to the exit. Try Arena Sport located before heading up at both Beckenried and Emmetten as well as the mountain station at Klewenalp. There are several play areas (a good one is by the gondola exit at Stockhütte for example). Sledding is popular and you can easily rent sleds on arrival. There are loads of walking trails and frequented by people who are not skiing. Non- skiers could also walk modest distances to meet skiers for lunch (probably best if you all start at the Klewenalp side for this). There are plenty of huts to enjoy lunch at both Klewenalp and Stockhütte. If you are traveling as a ‘family’, when you buy your tickets for the day you are offered a ‘family’ ticket which costs 130 Francs and includes lunch (2 x fries, chicken nuggets and fries, spaghetti Bolognese … plenty to share between 2 adults and 2-3 children we find) which you can get in several different restaurants on both sides of the resort. This is good value if you would be stopping for lunch anyway and don’t want to bring your own. This ski area is family friendly, is not generally all that well known, and often has great snow. It tends to be a bit less crowded and manic than places like Engelberg and Hoch Ybrig, for example. For us, coming from Canton Zug it is easy and quick to reach. Top tip: Try Saturday afternoon skiing (Sunday is nearly always a busier skiing day in all areas). If you buy your ticket after 11am they are cheaper. A further advantage if you arrive after 12 is that the ski school lessons are on a break or finished for the day. There are still a few lessons in the afternoons but fewer it seems, and therefore fewer skiers. Don't forget about the Family Ticket including lunch. We are a family of 4. Before we had children we were already keen skiers and determined to help the girls (now 9 & 7) to learn to enjoy skiing with us. If children tire here there are various play areas next to the slopes. One of you can head off for a few more runs and the other can hang out with a coffee. A big thanks again to Jenni for another sharing another great destination. Do you have a ski area you return to time after time that you would like to share with the Simple Family Travel community? It doesn't have to just be to ski - do you enjoy sledding? Snowshoeing? A spa?! We also love to hear stories about wintertime activities of families who don't ski. Get in contact!